Shake, Rattle & Roll – has been awarded Branson’s Best New Show for 2010 by Branson Show Awards! It’s time to Shake, Rattle & Roll all the way back to the fantastic 50’s! Travel back to the time of poodle skirts and blue suede shoes and enjoy the biggest and best Rock n Roll show ever. Featuring a phenomenal cast of singers and dancers, Shake, Rattle & Roll is a non stop hit parade of Rock & Roll classics that is guaranteed to leave you dancing in the aisles. From our multi award winning producer David King, who also brought Broadway! The Star-Spangled Celebration, The Twelve Irish Tenors and Spirit of the Dance to Branson, Missouri- Shake, Rattle & Roll is now a substantial world wide hit. Originally produced for his Monte Carlo venue, Shake, Rattle & Roll is an American Jukebox sensation that has wowed audiences everywhere. This show will take you on a trip down memory lane with your favorite classic songs such as; “Good Golly Miss Molly”, “Da Do Ron Ron”, “Rock Around the Clock”, “Only You”, “Blue Suede Shoes” and many, many more. Within the era of 1950’s and 60’s, this show will be a doo-wop complete with poodle skirts and bobby socks. Branson Variety Theater is thrilled to announce the North American Debut of this amazing hit show. Christmas is also a definite hit with Shake, Rattle & Roll Christmas Show! Enjoy your favorite classic Christmas songs, along with the best of the 50’s & 60’s. Hooray for Hollywood!, the amazing harmonies of The Twelve Irish Tenors and also New for 2011- the festive Holiday celebration of Hollywood’s Christmas Spectacular! 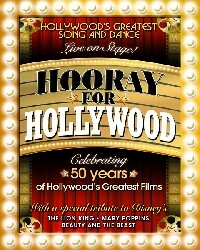 New Show in Branson for 2011- Hooray for Hollywood! This is Branson’s most exciting new show for 2011! It’s the all singing, all dancing Movie Musical Hooray for Hollywood! Featuring the most famous song and dance moments of the last 50 years of movie history- recreated live on stage at the Branson Variety Theater. Join us as we take you on a nostalgic journey through the most popular movie musicals of the last 50 years. You will see film clips of your favorite movies, and then watch the action unfold, live on stage, as our wonderful cast of singers and dancers perform the greatest song and dance from the greatest movies- live in concert. With the magic of todays’ technology, Branson Variety Theater will make you feel as if you are a part of that magical movie scene. Hooray for Hollywood! is the number one must see new show for the 2011 season. Featuring highlights from famous movies, from Singin’ in the Rain, Butch Cassidy and the Sundance Kid to Disney’s “The Lion King”, this all new, all singing and dancing production will thrill and excite you as your favorite movie moments actually come to life before your eyes!